In this article, we revisit the investment thesis for Investors Title Company which was first profiled on The Rational Walk in November 2010 with an update provided in March 2011. Investors Title is one of the smaller players in the title insurance industry which provides an essential but little understood product required for nearly all real estate transactions in the United States. At the time of the initial write-up, we noted that Investors Title appeared to be significantly undervalued but offered no particular assessment regarding when Benjamin Graham’s famous “weighing machine” would close the valuation gap. In recent weeks, the market has assigned a valuation to the company that appears to be more appropriate, yet no obvious “catalyst” was responsible for the change in valuation. After a brief detour into the workings of the “weighing machine”, we examine what has transpired at Investors Title over the past year and assess the company’s current valuation. It is easy to dismiss financial markets as hopelessly psychotic given day to day gyrations in prices that often have little to do with changes in the underlying economics of a business. However, the fact that few investors are able to outperform market indices consistently should lead one to approach market prices with some respect. When an investor decides to take a position in a security, he is implicitly saying that the collective opinion of his fellow market participants, as expressed in the current price, is mistaken. The questions that must be answered include why the market’s assessment is mistaken and what timeframe is being considered by market participants. Whether the market is “right” or “wrong” very often depends on the timeframe in question. Most market participants have a short term outlook, despite protestations to the contrary. Institutional investors may simultaneously agree that a security is deeply undervalued but refuse to purchase shares because there is no obvious “catalyst” that would drive the stock price up during the current quarter. 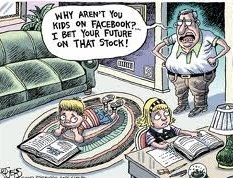 One only needs to read interviews with “long term” individual investors before and after the recent Facebook initial public offering to observe that while most everyone claims to have a multi-year time horizon, almost everyone wants instant gratification instead. Value investors who can identify undervalued securities without obvious catalysts and are willing to own shares without knowing precisely when the “weighing machine” will reflect intrinsic value have an important advantage over the vast majority of market participants. As we noted in the original write-up in November 2010, Investors Title is one of the smaller players in the title insurance industry and has traditionally focused on markets in the southeastern United States. In 2009, 44 percent of direct premiums were written in North Carolina where the company was founded in 1973. North Carolina, South Carolina, Virginia, and Tennessee accounted for 65 percent of direct premiums in 2009 demonstrating that management was not straying too far from its home base. Notably, the company lacked exposure to markets that suffered the worst of the real estate bust such as Florida, Arizona, Nevada, and California. As explained in the original write-up, although title insurance is not directly triggered in cases of home prices falling, the discovery of title defects tends to rise in falling real estate markets. 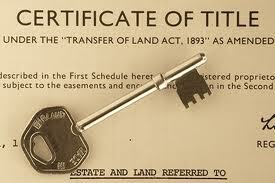 Starting in 2010, Investors Title began an aggressive expansion into the Texas market. 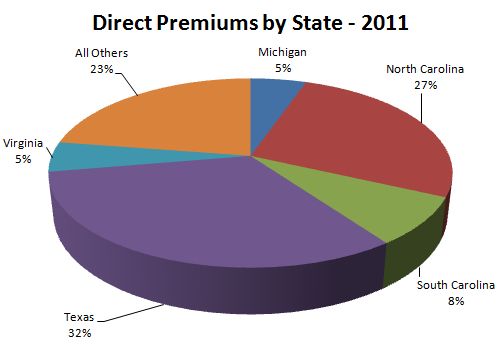 From a standing start with no reported volume in 2009, Texas accounted for 32 percent of direct premiums in 2011 moving North Carolina into second place at 27%. Total direct premiums increased from $62.2 million in 2009 to $81.6 million in 2011 with Texas accounting for $26.3 million of the 2011 total. Texas has accounted for more than all of the premium growth over the past two years. Whether this is a positive or negative change remains to be seen but the geographic distribution of business has clearly changed. The following exhibit displays key data related to Investors Title’s performance over the past three years. This is not a comprehensive discussion of financial results which can be obtained in the company’s latest 10-K for 2011 and 10-Q for the first quarter of 2012. Revenues. We can see that title insurance revenues increased significantly in 2011 which was driven by the expansion into Texas as discussed previously. Total revenues shows a similar pattern. The difference between total revenues and title insurance revenues is accounted for by the combined effect of investment income, realized gains and losses, and other revenues driven from fee, trust, and management services income. Net Income. 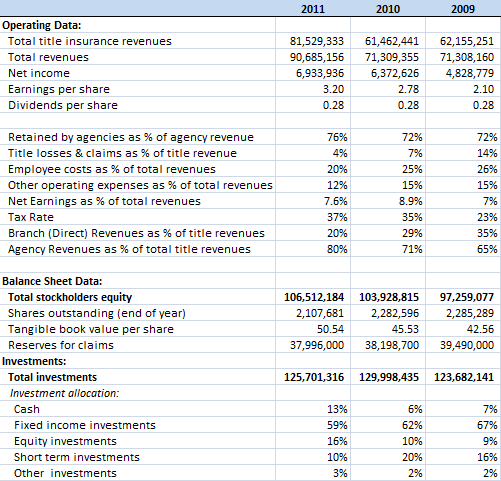 Net income rose from $4.8 million in 2009 to $6.4 million in 2010 and $6.9 million in 2011. Earnings per share advanced at a faster rate due to declining share count driven by repurchases of common stock. Net income as a percentage of total revenue declined from 8.9 percent in 2010 to 7.6 percent. Agency Retention. One of the most important metrics for a title insurance company is the percentage of premiums retained by agents. This is particularly important for Investors Title given the increasing percentage of total title insurance revenue attributed to agencies which rose from 65 percent in 2009 to 80 percent in 2011. We can see that agency retention jumped from 72 percent in 2009 and 2010 to 76 percent in 2011. According to the company’s filings, this is primarily due to the expansion into Texas which is a market that has higher commission rates. Losses as Percentage of Title Revenue. Title losses and claims as a percentage of title revenue fell from 14 percent in 2009 to 7 percent in 2010 to 4 percent in 2011. This is clearly a significant improvement, but the loss ratio rose to 8.3 percent for Q1 2012. From 2001 to 2011, the average loss ratio was 11.7 percent, so recent results are showing a lower than normal level of losses. According to the company’s 2011 10-K report, the drop in the loss ratio from 2010 to 2011 was primarily due to favorable development for prior policy years. Loss estimates are subject to significant error. At 12/31/2011, 83.6 percent of the $38 million in loss reserves on the balance sheet were incurred but not reported (IBNR), meaning that a large portion of reserves are estimated by management. Book Value per Share. Total stockholders’ equity increased from $97.3 million at 12/31/2009 to $106.5 million at 12/31/2011 while shares outstanding fell from 2.3 million to 2.1 million due to repurchases. Tangible book value per share rose from $42.56 at 12/31/2009 to $50.54 at 12/31/2011. Tangible book value per share advanced further to $51.74 at 3/31/2012. We are hard pressed to identify reasons for the wild gyrations in price, although someone inclined to do so could probably look for real estate related headlines for the periods where major moves were made and attempt to reconstruct a storyline. Doing so, however, would be quite pointless as the better explanation seems to be that the stock price of Investors Title only had a vague correlation with business results. It is true that business results improved along with book value over this timeframe, but the magnitude of the stock price advance was far greater than the increase in book value or intrinsic value. In our November 29, 2010 write-up, we noted that Investors Title was trading at a market capitalization of $66.5 million versus tangible book value of $102.5 million as of September 30, 2010. We also noted that the valuation history of Investors Title suggested that there were relatively few years when the market price of Investors Title common stock did not at least match or exceed the prior year-end book value per share. Given the fact that Investors Title appeared to be significantly overcapitalized, a large percentage of the intrinsic value is derived from its investment holdings. The main risk to stated book value is that insurance reserves may be understated, but the company’s long term track record did not indicate a strong likelihood of major reserve problems. Overall, trading at a price of $29.15 vs. tangible book value of $44.86 per share, buying shares appeared to be equivalent to buying one dollar for only 65 cents. Since the original write-up, the stock price has advanced from $29.15 to $54.50, or 87 percent, while tangible book value per share has increased from $44.86 to 51.74, or 15.3 percent. Clearly, the stock price has significantly outperformed the business over the past nineteen months. With the current stock price at a slight premium to the last reported book value, Investors Title is clearly not the 65 cent dollar it once was. However, it remains a profitable business with a demonstrated history of growing book value per share over time even through some very difficult economic conditions. There is no reason to think that Investors Title will be unable to grow book value at mid-to-high single digit rates for many years to come based on its demonstrated earnings power. However, double digit growth in book value seems somewhat unlikely given the fact that the company has so much of its capital invested in fixed income securities. Additionally, the risk profile of the business itself has increased due to the expansion into Texas which has suddenly become the company’s largest market. One of the reasons it is important to document an investment thesis prior to initiating a position is because otherwise one might be tempted to change the rationale for an investment over time without subjecting the change to serious examination. If an investment was initially purchased based on a large discount to tangible book value, it should be sold when that discount is no longer present unless there is reason to believe that the company can compound book value at rates of return higher than the investor’s hurdle rate over long periods of time. If Investors Title seemed sure to compound book value at 10 to 15 percent over the next decade, it would probably not make sense to sell merely because the initial discount to book has been eliminated. However, facing the prospect of relatively modest growth in book value per share going forward, the case for shifting the investment rationale in order to justify holding the shares seems quite weak. At the time of the original write-up, there was no catalyst identified that would erase the gap between the stock’s market price and intrinsic value. In fact, the real estate market was in poor shape and not expected to recover anytime soon. The real estate market is still in poor shape today and not expected to recover anytime soon. If we look at the stock chart presented earlier, it is hard to see what catalyst drove the market gyrations. There seems to be no specific catalyst responsible for moving the shares toward intrinsic value. Given the choice between an undervalued security with no identifiable catalyst and one that has a very likely catalyst, intelligent investors would pick the latter because it is always preferable to have a sense of how long one will have to wait. Annualized returns would obviously be far greater if we could buy into undervalued situations shortly before a catalyst magically drives the shares to full value but the investing world doesn’t seem to work that way. By the time a catalyst is obvious, the undervaluation may have already vanished. Or there may never be a catalyst and the share price may simply reflect intrinsic value for unidentified reasons. Value investors who are willing to commit funds to undervalued investments without identifying a specific catalyst have a wider array of possibilities available and an advantage over those who simply must “know” when their investment will turn a profit. Disclosure: The author of this article closed out his position in Investors Title between June 6 and June 20, 2012 at prices ranging from $51.80 to $54.50.